Las Vegas is a city of variety. It’s a destination that boasts a wide range of entertainment, hotel and food options that cater to all sorts of visitors and guests. The party scene in Vegas is no exception. Looking to soak up some sun while sipping a mixed cocktail by the pool? This city has you covered. How about an evening, dancing the night away in high-energy fashion? Vegas has that, too. There’s fun to be had and memories to be made at both daytime and nighttime parties. But what’s the major difference between the two? For starters, there’s very little to hide at a daytime event – especially for the DJs. The vibes of a daytime party differ from that of a nighttime party as well. 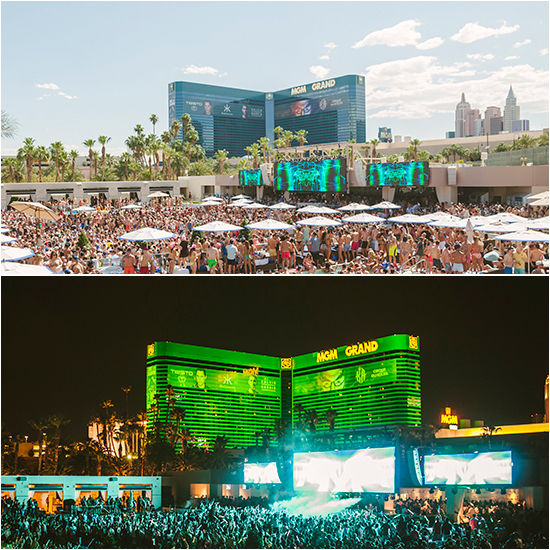 For example, the guys of Showtek would characterize Wet Republic during the day as a more relaxed environment. “Definitely at the pool party, people just want to have a good time,” Wouter Janssen said. “It’s a little more easy-going,” his brother, Sjouerd Jannsen added. To celebrate EDC Weekend, Wet Republic Ultra Pool is offering both nighttime and daytime options for partygoers next week. On Wednesday, Showtek invades the pool for Wet at Night. The following day, sisters Jahan and Yasmine Yousaf, best known to the world as Krewella, headline a special evening event at Wet Republic. Buy your tickets to both events by clicking the following links. You can find tickets to all of Wet Republic’s EDC Weekend festivities here.